The beautiful flower of Streptocarpus goetzeanus, a species that is notoriously difficult to grow in cultivation. 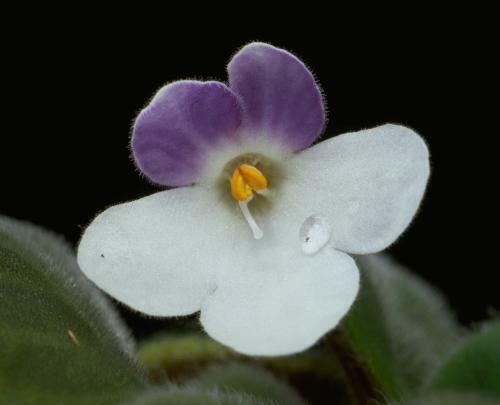 A number of additional African violet species were collected or described over the next 50 years including Saintpaulia goetzeana in 1900, Saintpaulia grotei in 1921 and Saintpaulia inconspicua in 1934. B.L. Burtt organized the various species through two monographs in 1958 and 1964. Eventually approximately 20 species and several varieties were described. Some additional plants such as “House of Amani” and “Sigi Falls” were acknowledged, but not given species or variety status. Burtt’s classifications of the species were often based on morphological differences such as leaf hairs and were often based on a single plant from a collection site.